How to Stay in Shape in Just 12 Minutes a Day! I have always enjoyed exercising and have been a runner for several years until some recent sports injuries. Now I am a biker and occasionally use a Nordic track machine (for inclement weather) or swim as an alternative. It is easy to incorporate exercise into my daily routine because I only need 12 minutes. For years I enjoyed running for 30 to 50 minutes at a time, maintaining a steady exercise pace. I also swam quite a bit, for about half a mile. 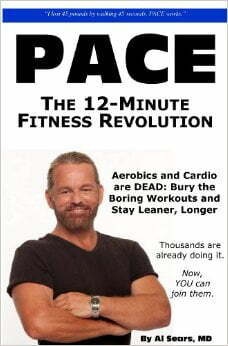 After reading Al Sear’s book PACE, the 12-minute Fitness Revolution, I was convinced that less was more. I changed my exercise routine and have never looked back. 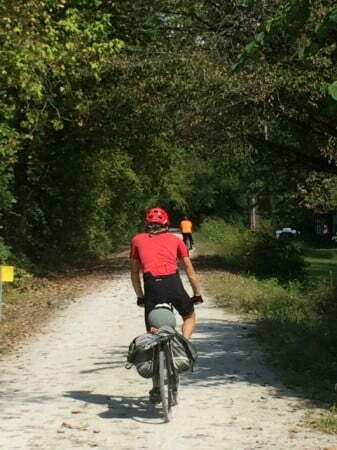 I still enjoy long hikes, walks and bike rides, but for daily exercise I limit my time and this makes exercising regularly much easier to fit in to my schedule. I generally work out between 12 – 20 minutes depending on the time available to me. Doctors Joseph Mercola, DO, Michael Mosley, MD and Al Sears, MD have all written extensively about the health benefits of short interval training type exercise. Research supports that less, more intense exercise offers more health benefits in terms of heart and lung capacity, along with insulin resistance and weight loss. What is particularly dangerous to the body is long marathon running, which the body was not made to do. Research demonstrates that steady exercise (i.e. running for 30 minutes) actually trains the lungs to work less effectively compared to short spurts of high expenditure which expand the lung’s capacity. Lung capacity is closely associated with mortality rates. Higher lung capacity, created by short bursts of energy or interval training, is associated with longevity, while reduced lung capacity is linked to death. Sears writes in detail about this in his PACE book. Dr. Sears compared the blood flow to lungs and cardiac output during high exertion compared to low exertion and found an increase of more than 400 percent. A study by physicist Manfred von Ardenne discovered that individuals, including those in their 70’s who challenged their lungs with techniques similar to those used in Sears’ PACE workout, were able to increase their maximum oxygen uptake to levels averaged by someone much younger. When exercising at a steady pace for 30 minutes, your heart and lungs are actually being conditioned to work less efficiently. Their functioning capacity reduces to accommodate the steady, slower pace of exercise. Because both lung and heart capacity are associated with longevity, this is NOT the type of exercise that is most beneficial. Mercola reports that Dr. Michael Mosley, author of Fast Exercise: the Simple Secret of High-Intensity Training improved his insulin sensitivity by 24 percent by doing intense exercise for 12 minutes per week for only four weeks. Several studies demonstrate that high intensity interval training burns more calories in less time. Research presented at the Integrative Biology of Exercise Vl meeting showed that high intensity interval training done for a mere 2.5 minutes, divided into five 30 second sprint intervals at maximum exertion, followed by four minutes of light pedaling to recuperate, can burn as many as 220 calories. Other studies show that 12 weeks of high intensity interval training exercise results in significant reduction in total abdominal, trunk and visceral fat. Long distance marathon running has a 2500 year history. In ancient Greece, the very first marathon runner dropped dead after his historic 26.2 mile run. Phidippides, a soldier and messenger, ran from the Greek city of Marathon to Athens to announce the victory of the Greeks over the invading Persians. At the time that he yelled “Nike!” (Victory! ), he collapsed and died. In more recent times, there continues to be documentation of deaths associated with marathon running. In 2006, at least 6 runners were documented to die in marathons. In 2007, two high profile marathon related deaths occurred in the US. Marathon runners have been known to drop dead from heart attacks for as long as there have been long distance runners. While statistically this is very unlikely to occur, it often occurs in younger individuals in the prime of their lives, making it even more tragic. Modern testing demonstrates health damage after runners jog long distances. The increased risks associated with long distance running include: heart attack, hardening of arteries, lower back pain, repetitive stress injuries, stress fractures, sudden cardiac death, blood in urine and permanent bone damage. Find an exercise that you enjoy. It can be swimming, biking, walking, running or using an exercise machine. Find 12 to 20 minutes at least 3 times per week to exercise. Warm up for a couple minutes, then increase the intensity of your exercise. 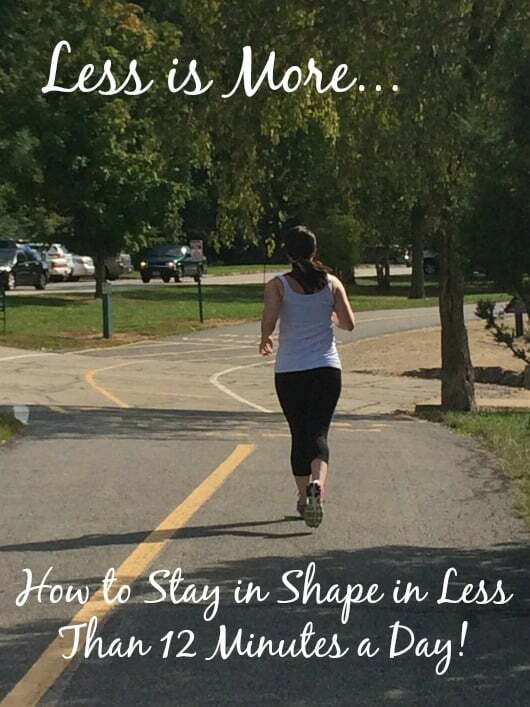 Work up slowly and daily increase the intensity of your exercise, then slow down. Eventually exercise as intensely as you can for 20 seconds to 4 minutes, then recover for 30 to 90 seconds. If your neighborhood has hills, this is a good natural way to increase intensity by biking, walking or running outdoors, up and down an incline, while also enjoying fresh air. It is important to vary the exercise and intensity, along with times so that your body is constantly being challenged. Another option is to do what Mercola calls a ‘peak fitness’ program in which 3 minute are spent warming up followed by 20-30 seconds of intense exercise, followed by 90 seconds of rest. This pattern is repeated for 8 cycles and ends with 2 minutes of cooling down for a total time of about 20 minutes of exercise. Enjoy exercising in less time while increasing your heart and lung health. You will burn more calories and improve your insulin resistance, as well. An added bonus is that you will benefit from increased energy, mental clarity and mental health that come with exercising. To learn more, see Sears’ book: P.A.C.E; The 12-minute Fitness Revolution and/or check the sources below! 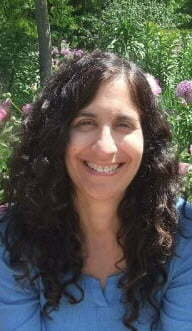 Michelle Goldstein is a mental health therapist, passionate about holistic health and healing. She writes for Natural News and Vac Truth and can be found at her new health website Holistic Health to Go, along with Holistic Health to Go Facebook Page. Check out her blog! Hubby and I have replaced our slow boring jogs with sprint intervals for a couple years. 30 second all-out sprinting (like someone is chasing you on the playground when you were a kid), then 2 minutes of recovery walk. 8 repetitions of this is an incredible workout in only 20 minutes! Now if I could just be consistent 3 times a week, I’d really shed my tummy! Rebounding is also good and ttapp is probably the best, if you have the discipline to stick with it. Also I have found some of the Leslie Sansone tapes, especially the earlier ones, to be easy to stay with. In the 1980 s aerobic dancing was a lot of fun, because it was choreographed and done in a social setting. Later, what was billed as aerobic dancing was just boring repetitions of the exercise the leader thought of at the moment. BORING. The earlier routines had warm up and high intensity and cool down built right in. I think a day of rest now and then is a good thing. If exercise is play, okay, but if it is work, at least skip your workout on Sunday. I think I fixed it, thanks for pointing it out!